An intaglio carving is cut into the surface of the material and a cameo is in relief. The art of gemstone carving was known in ancient Greece and Rome and revived in Renaissance Italy, when connoisseurs began to form rich collections of engraved stones. 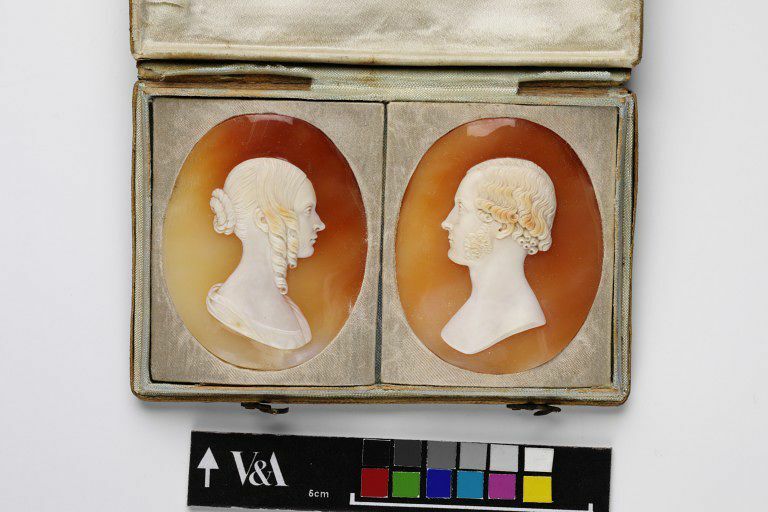 Shell cameos, which were cheaper and more easily worked, became fashionable in the 19th century. Many were bought by tourists as souvenirs. It has not been possible to identify the sitters for this pair (the other being Mus. no. A.119-1978) of portraits to date. The pair are typical of portraits commissioned by Grand Tourists at this date from the cameo cutters of Rome. Dies (1796-1839) was one of the most successful cameo cutters of his day in Rome, with an annual turnover of about £5000. Draped bust of a woman to right. Her hair is caught into a bun at the back, with two fat ringlets falling down the side of her head from a central parting. Historical significance: The pair are typical of portraits commissioned by Grand Tourists at this date from the cameo cutters of Rome. 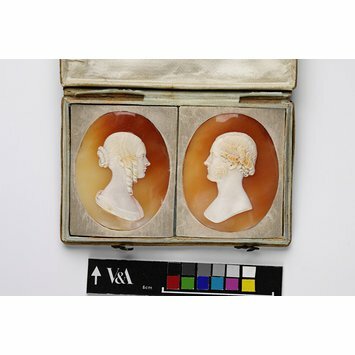 Dies (1796-1839) was one of the most successful cameo cutters of his day in Rome, with an annual turnover of about £5000. He was among a group of gem-engravers who supplied gems to Prince Stanislaus Poniatowski, the owner of the notorious series of fake antique gems. It has not been possible to identify the sitters for this pair (the other being Mus. no. A.118:1-1978) of portraits to date. They were acquired in their original leather case (A.118:2-1978), which has a label on its base bearing the name of Giovanni Dies (and a third word, which is illegible).